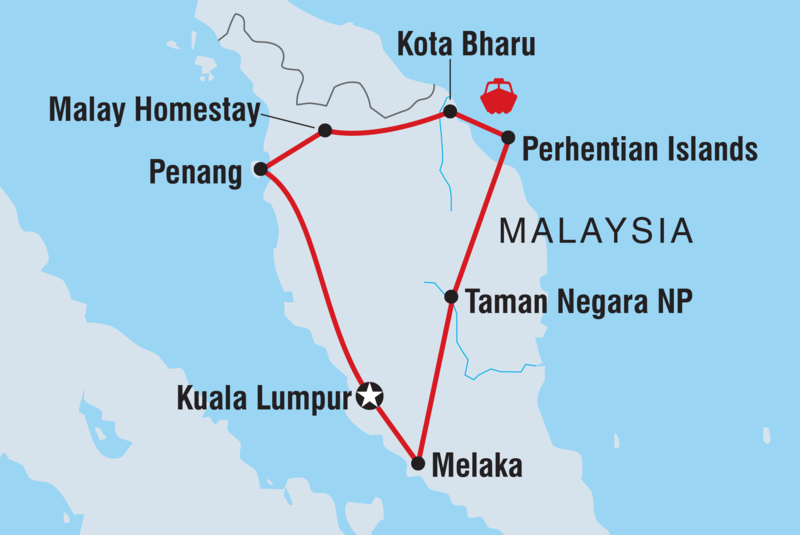 This two week Malaysia tour takes you on an anti-clockwise round-trip from Kuala Lumpur by way of Taman Negara National Park, the Perhentian Islands and Penang to ensure you get to experience the very best of the Malay Peninsula from stunning scenery to colonial contrasts. From nature trails in rainforests and snorkelling over tropical coral reefs to haggling at local markets and unravelling the strands of religious and cultural identity, this Malaysia tour leaves no stone unturned when it comes to unique experiences and is ideal for travellers visiting Southeast Asia for the first-time. As you’d hope from a Malaysia tour, you’ll be given lots of chances to meet local people with a homestay experience in a rural village, set amongst rice paddies, often one of the most memorable moments amongst an eclectic itinerary based around Malaysia’s best bits. Diverse and culturally rich, this trip captures the very essence of Malaysia. From the contrasting cities of ""KL"" and Melaka, to the natural wonders of the world's oldest rainforest and the marine life around the Perhentian Islands, Malaysia has so much to offer the adventurous traveller. We visit the historic old port town of Melaka, where ancient Malay, Chinese and Nyonya traditional ways still abound and contrast with the European influence of a colonial past. The ancient rainforest of Taman Negara provides us with an opportunity to get back to nature, with a jungle trek and a night spent in a large cave. The unspoiled reefs and crystal clear waters of the Perhentian Islands invoke all kinds of peacefulness, which continues as we visit our longtime friends, Aziz and Asiah, on their island homestay just out of Kuala Kangsar. After the morning call of gibbons, we take a walk through a traditional kampung, rubber plantations and on to a cascading waterfall.The regional cuisine is delicious and there might even be a chance to learn traditional cake making and sampling your efforts for an afternoon tea. On the second night of our stay we sit on the floor of a local home to eat a traditional wedding-style banquet and learn about Malay culture. Wearing a sarong and eating with our right hand are all part of blending into our environment. - Our leaders facilitate communication of our values to travellers and local communities, educating them in sustainable tourism practices. - We employ local guides to aid travellers' understanding of local culture and etiquette. - Small groups allow travellers to experience cultures at first hand, offering greater opportunity for cross- cultural understanding. Try everything! Don't take your best clothes as much of the holiday is spent getting quite sweaty.